Joss Whedon’s pulled off something only a few creators before him did. He created a science fiction show that so captivated the imagination of viewers world wide that ‘cult’ doesn’t even begin to describe it. Like “Star Trek” before it, “Firefly” had a short life during its initial run, got cut down in its prime but was resurrected as a major motion picture. The good thing is that “Firefly” fans didn’t have to wait quite as long as the “Star Trek” fans did and during the wait, “Firefly” was rebroadcast on The Sci-Fi Channel which only helped the reputation of the series as a whole and allowed a bunch of folks who came in late to see just what all the fuss was about. I was one of those who came in late. When “Firefly” was originally shown on Fox I was working nights at Home Depot and never could remember to set my VCR to tape the show. Naturally I was a major fan of Joss Whedon’s other TV shows; “Buffy The Vampire Slayer” and “Angel”. Both shows delighted me with their wonderful dialog, plot twists and sharp characterizations and I was highly intrigued by the descriptions of “Firefly” which everybody told me was basically ‘The Wild Bunch In Outer Space’ I didn’t catch the series until it started it’s run on The Sci-Fi Channel and immediately became hooked. And now we’ve got the movie SERENITY which achieves a couple of remarkable feats for a movie based on a television show: first off, unlike the “Star Trek” movies, it doesn’t feel or look or play like an episode of the series on steroids. This is a major story with major consequences for all the characters. Second; it manages to fill in anyone who hasn’t seen it on the backstory of the characters and the universe they inhabit without confusing the hell out of those who have never seen “Firefly” or boring to tears those who have. Third; it stands on its own as a thrilling, edge of your seat science fiction action adventure. The last 45 minutes alone are enough to give you a heart attack from sheer adrenaline overdose. Its 500 years in the future and mankind has effectively used Earth up but that’s okay since there are thousands of other worlds out there that have been terraformed so that humanity can spread out. This makes for an interesting contrast since the inner worlds are at the pinnacle of technology and luxury while the outer worlds scrap by as best they can with little of either. You could be flying a starship through a nebula in the morning then riding along a dusty trail on a stallion with a wagon train in the evening and nobody bats an eye or thinks it odd. Out on the fringes mercenaries play their trade, taking jobs of questionable legality and flying under the radar of The Alliance. These are people who would cheerfully hijack The Enterprise and sell it to a Klingon chop shop for parts. Captain Mal Reynolds (Nathan Fillion) was once a decorated soldier who fought against The Alliance. 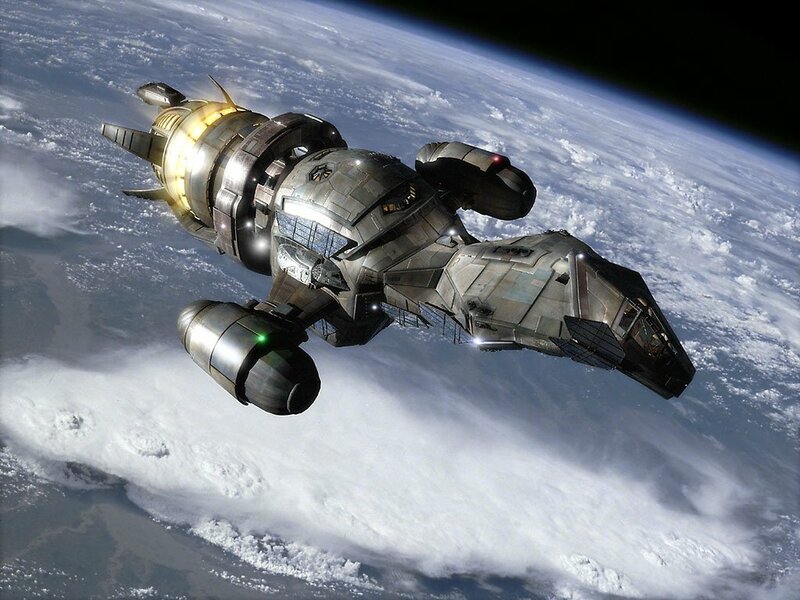 After the war he bought a Firefly-class freighter, named it Serenity and looked for a crew. His first recruit was Zoë (Gina Torres) who fought with him in the war and continued to serve with him after it was over with a fierce loyalty one rarely sees. Her husband, the sometimes goofy Wash (Alan Tudyk) signs aboard as pilot. He’s more easy-going than the rest of the crew unless his wife is in danger. Kaylee (Jewel Staite) is the ship’s mechanic who is infuriatingly upbeat and perky, even when she’s about to be ripped apart and eaten alive. Jayne (Adam Baldwin) is a hulking, mean-tempered brute that serves as Mal’s enforcer. Inara (Morena Baccarin) is a licensed Companion (yeah, it means just about what you think) who has a running love/hate battle with Mal. 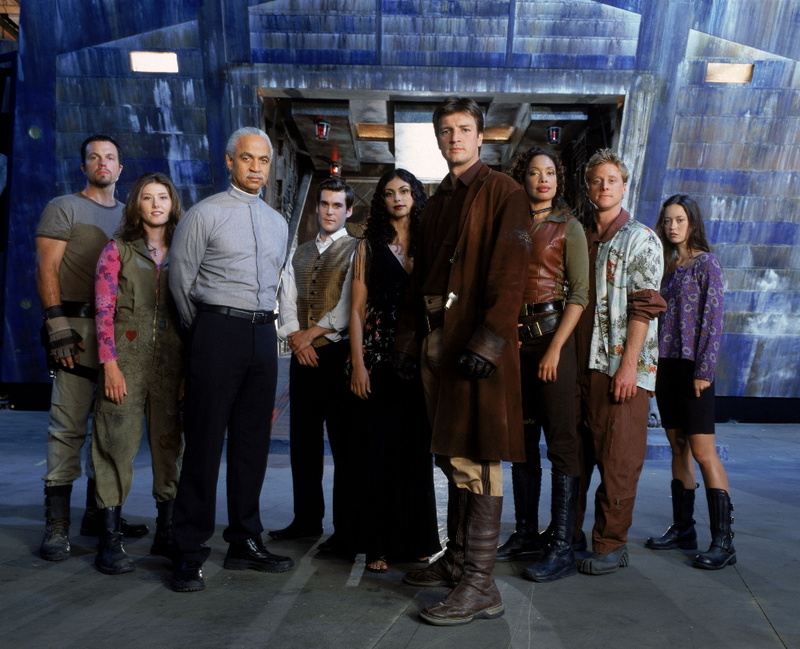 During their adventures during the television series Serenity picked up three more crew members: Shepherd Book (Ron Glass) a man of faith with some dark days in his past and Dr. Simon Tam, who along with his sister River is really at the core of the story that drives the movie’s plot. Simon has rescued his sister from an Alliance hospital that is more like a chamber of horrors. It was here that River was programmed to be a living weapon of extraordinary skill and grace and The Alliance fears that River’s powerful psychic abilities may have uncovered some of The Alliance’s greatest secrets and indeed she has: one that involves the death of an entire planetary population and the truth behind the star spanning cannibalistic hoard known as The Reavers. To prevent this secret from being revealed, The Alliance has sent The Operative (Chiwetel Ejiofar) after them and once he learns that River is aboard Serenity, The Operative begins going after any and everybody who has ever given aid to the crew to force them to turn River over to them. It becomes a race to stay ahead of The Operative as Mal and his crew tries to find out what it is River knows and reveal the secret before they’re all killed by The Operative and the forces of The Alliance or even worse, captured by The Reavers. SERENITY is quite simply, a terrific movie. There’s a surprising amount of characterization for such an action packed movie but that’s because Joss Whedon knows how to use dialog to maximum efficiency to move the story along and reveal character and that’s what it does here. The interaction between the characters is one of the best things about the movie and the scenes where the crew of Serenity argues and bicker about their situation and how they’re going to survive it have real meat and crackle in it. It’s some damn fine writing. And Whedon was smart to choose to resolve the River Tam plot from the television series since if we never get another Serenity movie we at least have that explained. In fact, there are a number of subplots that are resolved and by the end of the movie, nobody is the same as when it started and the whole dynamics of the crew has been changed in a bittersweet yet exciting way. The action scenes are really exciting with the final shootout with the dreaded Reavers being one of the most nail-biting scenes I’ve seen in any movie and Joss Whedon manages to wring every drop of suspense out of the scene. I was actually thinking for about five minutes that he was going to give us an ending like that of “The Wild Bunch” or the final episode of “Blake’s 7”. In fact, SERENITY at times reminded me of “Blake’s 7” in tone in that each of the characters have their own agenda for being on the ship: some are strictly there for the money. Others for altruism. Others because they’re on the run. Nobody’s a complete good guy but they’re not all bad either. It makes for a different vibe than “Star Trek” where everybody polished up their medals every chance they got while reciting The Prime Directive. The acting is a lot better than movies of this genre usually sees with Nathan Fillion, Gina Torres, Adam Baldwin, Summer Glau and Chiwetel Ejiofar being the standouts here. A great bad guy can make a movie and as The Operative, Chiwetel Ejiofar is outstanding. The Operative is a terrifying opponent not just because he’s so physically adept but he’s such a pleasant, friendly guy even while he’s mass murdering everybody in sight. Part of what makes him so dangerous is that he never raises his voice or gets mad and sounds like he’s making perfectly good sense while he’s figuring out the best way to stick you with his sword. And Adam Baldwin looks like he’s having a ball as Jayne Cobb who wants only to earn a dishonest dollar and stay away from Reavers. And he’s got most of the funniest lines in the movies and my vote for the best one of all and no; it’s not the one you’re thinking of, either. And Summer Glau takes the last hour of the movie and makes it hers without question. So should you see SERENITY? Chances are that you’ve probably seen it already and if you have then I have no need to recommend that you do so. But if you haven’t seen it yet and are still debating about it, then take it from me: Netflix it. It’s a superior piece of space fantasy that has intelligence, wit, charm and takes itself seriously but not too seriously if you know what I mean. Despite the dark twists the plot takes, SERENITY has its eye firmly on one objective: to immerse you in a terrific adventure movie and it does so in a grand and good-old fashioned Saturday afternoon adventure movie style. Enjoy with my blessings. I LOVE this movie. It’s one of my comfort films that will turnaround the crap-lousiest day. Thanks for the reminder-review. Love this movie. The scene where Mal asks the Operative if he’s carrying a gun and then shoots him when he says no is as good as any gunshot in any film. Great, great stuff. I loved Serenity and Firefly! BTW that’s spelled Reivers from the Old English meaning to gather or glean. Also liked Buffy and Angel especially Off World Angel. I don’t know if I can pick a favorite line from this movie. Needless to say, this is one of my favorite films. Whenever I hear people grumbling about Marvel’s selection of Whedon to direct The Avengers, my response consists of two words: “watch Serenity.” If that’s not enough proof the man can direct an action-packed, sci-fi team movie, I don’t know what is. Nobody’s doubting he can direct a movie. But can he direct a movie that makes money? Odin knows that I’m hoping AVENGERS rocks the house. You know what a major Avengers fan I am and I’ve been waiting my whole life for an Avengers movie. But I just don’t have a lot of confidence in Whedon’s as the director of such a major motion picture. But let’s face it, Uwe Boll could be directing an AVENGERS movie and I’d still go see it. I think all the hype surrounding Avengers and all the lead-up to it with two Iron Man films, Incredible Hulk, Thor and Captain America, it’d be impossible for this film to do bad. You COULD put Uwe Boll in the director’s chair and Avengers would still be a blockbuster. Avengers has been promoted to hell already and that promotion is only going to increase. In that situation, I’m positive there’s no way this film won’t be a license to print money. So in that case, I think it’s a good idea to find a director who has proven he can handle a movie like this. And I think Whedon definitely proved that with Serenity. But Serenity not making any money seems to have more to do with Universal doing jack to promote it than it did with Whedon’s ability as a director. It came out in October and I can’t remember any promotion for it. The only reason I heard about it was because a week after its release, I happened to be browsing movie trailers on Apple.com and saw it. And I’m a Firefly fan. Beyond that, I can honestly say I won’t lose any sleep whether or not the film makes any money (even though it will). Whedon can direct sci-fi, action and character in one film and balance them well. That’s the most important thing. I’d rather have an Avengers film that has those components but flops than a financially-successful Avengers film that’s in the style of Michael Bay.